MADI LEEDS is an indie pop singer-songwriter from Melbourne, Australia, with influences from artists such as Chairlift, HAIM and Sky Ferreira. Her prominent instruments used in writing include (self-taught) guitar and piano in which she took lessons for 6 years. Other instruments Madi has played over the years include flute, violin and trumpet, but prefers keys and electric guitar. This music is typically upbeat and sophisticated with synth layers and a steady drum beat, contrasting with dark lyrical content. Madi's performance nature tends to be quite quirky and energetic, being able to express her song's through the electric guitar as well as vocally. MADI LEEDS is known as a small yet energetic performer with a 'big voice' and 'creative spark'. When playing with a band of talented musicians who share the same love of music and playing, watching MADI LEEDS perform and have fun is contagious to audience members. MADI LEEDS' recently performed as part of the Sydney Fringe Festival with her band and is currently working on new music to release in 2019. 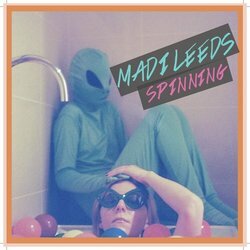 Unfamiliar Disaster is off of MADI LEEDS debut EP 'Spinning'. It is the most folk/ballad song off the EP, diving into more darker themes as Leeds questions what it is to be human and in love.